Aim for flow. Unless you are writing poetry or want to challenge your readers with clever word play, then you should provide as few impediments to fast reading as possible. If your writing is difficult then potential readers will give up after a while. There’s lots of advice online. Here’s some more to add to the mix. What impedes the reader? 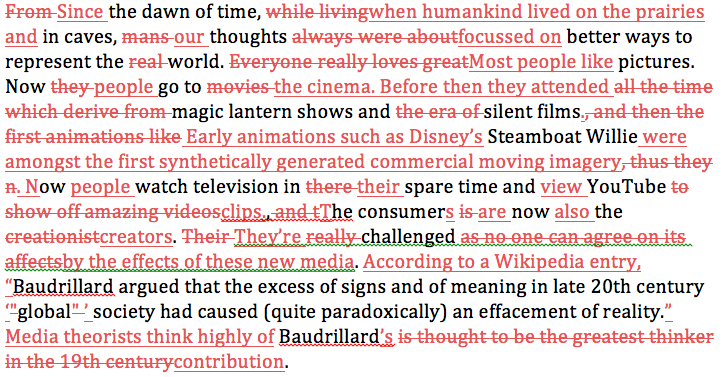 Writing in the wrong style for the medium, e.g. sensationalistic and “hyperbolic” writing in an academic paper: “The iPad is bringing about incredible changes in the way people consume media. Businesses should treat consumers as audiences rather than dumb marketing opportunities.” Don’t say that. Colloquialisms. Don’t use colloquial words and phrases in academic and formal report writing (business reports). Here are some words and phrases from the banned list: crazy, amazing, and really incredible. If in doubt look up words at www.oed.com. Clichés and idioms are best avoided, but if used then you need to get them right, and web browsing can help. “After the dawn of time” should be “Sincethe dawn of time.” Other idioms: Your university ranks amongst the best in the world; Rules about good writing are not carved in stone; I’m not prejudiced against pop culture — far from it; Don’t give up on blogging. Stick with it. The phases in bold are over-used idioms. Floating indexicals: indexicals are pronouns (they, it, them, those, these) that refer to something specific. These words “float” if it’s not clear from one sentence to the next what the pronouns are referring to: “Parents don’t seem to mind what their children watch. They like violent cartoons.” Does “they” refer to the parents, the children or both? Use nouns to make the meaning clear from one sentence to the next, or restructure your sentences. Who is doing what to whom? If you write, “Children are now encouraged to watch nature programmes,” then the reader will ask, “encouraged by whom?” “Children are now encouraged by their parents and teachers to watch nature programmes” is better, but still in the passive voice. The sentence is clearer, stronger and flows better if the main actors (the ones who do the encouraging) are at the start of the sentence: “Parents and teachers now encourage children to watch nature programmes.” Such active sentences are easier to follow. Lack of evidence: you would need to provide evidence for that last statement about parents and teachers, usually by referring to someone’s report on the matter. If you can’t cite any evidence then you could always turn it into a question (“Do parents and teachers now encourage children to watch nature programmes?”), or don’t say it at all. The long lead in: often the reader, and even the writer, is unclear what the paragraph, essay, report or thesis is about until they get to some crucial sentence either half way through or even right at the end. When editing your work, hunt out this sentence or group of sentences and move them to somewhere near the start of the paragraph, essay, report or thesis. It depends on the subject matter, but often it’s good to start an essay with a reference to what someone else (some authority) says about your subject. 9. Using too many words. “According to an OFCOM report, many of the people who watch television actually seem to rather enjoy the occasional television commercial” contains unnecessary words. Say, “According to an OFCOM report, many television viewers like to watch commercials.” Edit and re-edit your work before submitting it. Successful fiction writers and journalists are good at making every word count. We can learn from them. You would never write as badly as this. It’s an exaggerated demonstration to highlight some of the points raised above. You may encounter writing like this if you are a tutor. What advice would you give? From the dawn of time, while living in caves, mans thoughts always were about better ways to represent the real world. Everyone really loves great pictures. Now they go to movies all the time which derive from magic lantern shows and the era of silent films, and then the first animations like Steamboat Willie, thus they now watch television in there spare time and YouTube to show off amazing videos, and the consumer is now the creationist. Their really challenged as no one can agree on its affects. Baudrillard argued that the excess of signs and of meaning in late 20th century “global” society had caused (quite paradoxically) an effacement of reality. Baudrillard is thought to be the greatest thinker in the 19th century. Did we start in caves, in the forests, the prairies or the Garden of Eden? “Always” is too inclusive. There are always exceptions. better ways to represent the real world. Everyone really loves great pictures. Do you want to open up a philosophical debate about what is meant by “real”? “Pictures” is ambiguous. Do you mean moving pictures or just visual images? Not clear who they are. There’s no need to point out that people disagree here. “Affects” should be “effects,” a noun; “To affect” is a verb, unless you are referring to emotions (affects). That’s the wrong century and it’s an overstatement. The last sentence is in the passive voice so we have to ask, who thinks this? The idea of visual representation has a long history (Mitchell, 1995). Our affinity with the visual image extends to twentieth and twenty-first century film, video and animation. The popularity of YouTube suggests that the consumers of visual images are now both creators and producers. What is the effect of this new model of “prosumption” (Toffler, 1980) on the media business? Perhaps the philosopher Jean Baudrillard (1994) has something relevant to say here, especially in light of his insistence that globalised society has somehow “effaced” reality. Baudrillard, Jean. 1994. Simulacra and Simulation. Trans. S. F. Glaser. Ann Arbor: University of Michigan press. Mitchell, W.J.T. 1995. Picture Theory: Essays on Verbal and Visual Representation. Chicago: University of Chicago Press. Here are some references on how to write well. Gowers, Ernest, Sidney Greenbaum, and Janet Whitcut. 1988. The Complete Plain Words. Boston: D.R. Godine.